Blackjack is usually played with 4 to six 52-card decks. Cards 2 to 10 are counted with their numeric value while face cards are counted as 10 points and the ace is counted for either 1 or 11. The object of the game is for the player to beat the dealer's hand. The sum of his cards must be higher than the sum of the dealer's hand, but it must not exceed 21. In case of a stand-off, the bets remain open. There are 7 betting boxes with 3 positions (for three players). 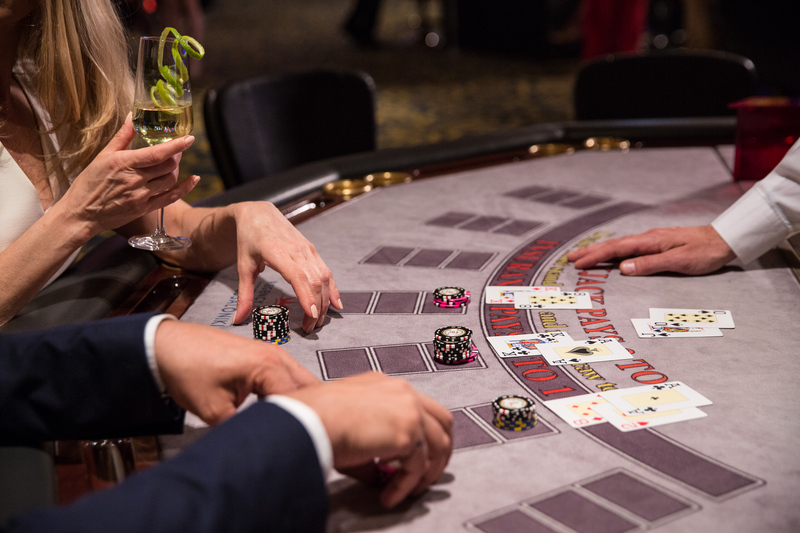 The player whose bet is at the front of the betting box is deemed to have control over the position, and the dealer will consult the controlling player for playing decisions regarding the hand. The bets are placed in the special spots (boxes) before any cards are revealed. 2 cards are dealt to each box and one card is dealt to the dealer. After the cards have been dealt, NO bet can be made, except in the cases of splits and doubles. Split = separation of two cards of the same value in two different boxes. Double = if a player has 2 to 11 points, he can double his bet by taking a single card. In both cases, the net can only be increased by the value of the initial bet. When splitting aces, the player receives a single card and his hand cannot be a blackjack, but only a 21. Blackjack is an ace and a 10. If the dealer has a blackjack and the player 21 then the dealer wins. If both have 21, then it is a stand off. Blackjack wins against any other hand. The pay-out odds for blackjack (21 with the first two cards in the hand) are 3 to 2, provided the dealer does have a blackjack too. In that case, the player neither wins nor loses (stand-off). All winning bets are paid out equally. We kindly ask you to remember that the dealers carry out the game according to the rules. They cannot advise you about the amount of your bet nor about where to place your bets, but they will be happy to help you familiarize yourselves with the rules of the game. If you wish to exchange your cash or chips, we kindly ask you to wait until the game stops so that you can let the dealer know and place the money on the table. Ace=1 or 11, Faces=10, All others=their numeric value. 1. In blackjack, a "hand" is the sum of points of the player's or dealer's cards in each round of a game. 2. Each "hand" exceeding 21 points loses immediately. We then say that the player (or the dealer) has "bust", that is, has exceeded 21 points. If the player's first two cards have a total score of 2 to 11, then they may choose to double the initial bet and receive only one more card. If a player's first two cards have the same value, then they may choose to split them and play with two "hands", adding a new bet, equivalent to the initial one. The dealer will split the two cards and deal new cards for the two new "hands". The cards can be split only once, so that they become two hands. The usual rules of the game, including doubling, apply for the split cards. Aces can only be split once, with each new hand receiving a single card. 21 with two cards in a split hand is not a blackjack and is paid out with odds 1 to 1, if it wins. If the dealer's first card is an ace, then players can take an insurance that the dealer will have a blackjack, if they want to. In that case, the player can place a bet starting at half the table's minimum amount and up to half of his initial bet on the insurance line. 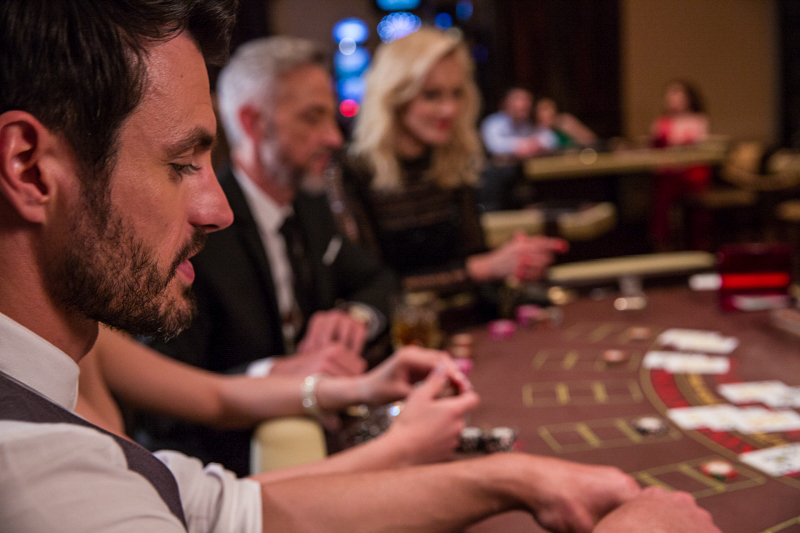 If the dealer has a blackjack, the insurance bet wins with pay-out odds 2 to 1. If the dealer does not have a blackjack, the insurance bet loses.